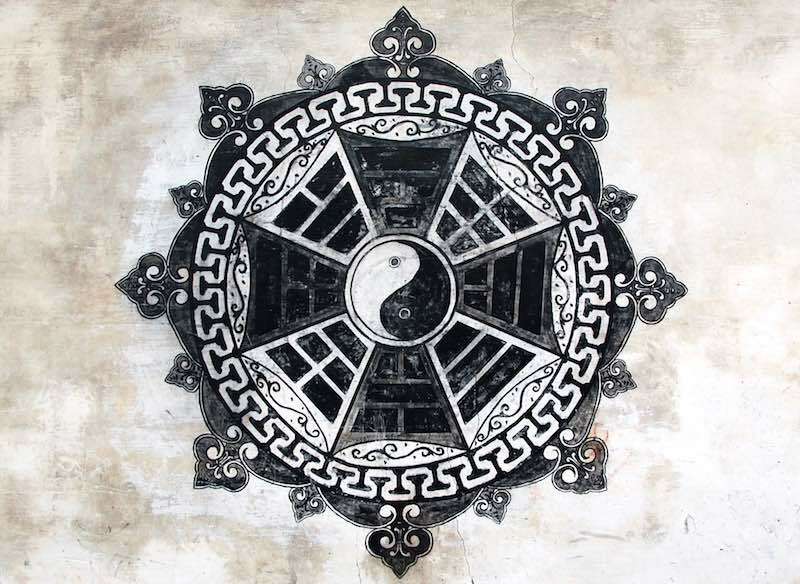 Zhuge Bagua Village (Zhuge Eight-Diagrams Village, 诸葛八卦村) is a historical Chinese village located 18km away from the downtown of Lanxi city, Jinhua, in the mid-west of China's Zhejiang province. Bell Pond, Zhuge Bagua, Jinhua. 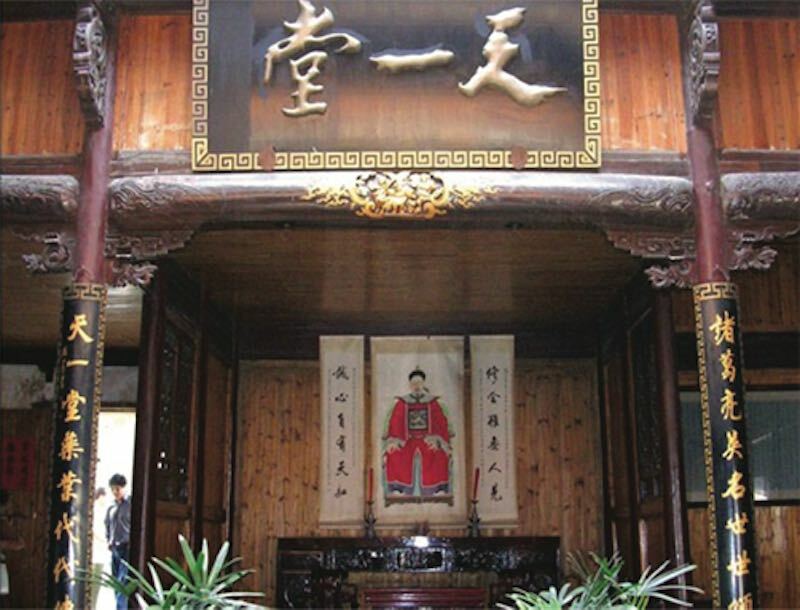 The village is home to 4,000 descendents of Zhuge Liang, an important military strategist, inventor, scholar, and statesman. He served as the Prime Minister of the Shu Kingdom in the period of the three Kingdoms (A.D. 220—265). He was considered a representative of great wisdom and resourcefulness throughout China’s history. 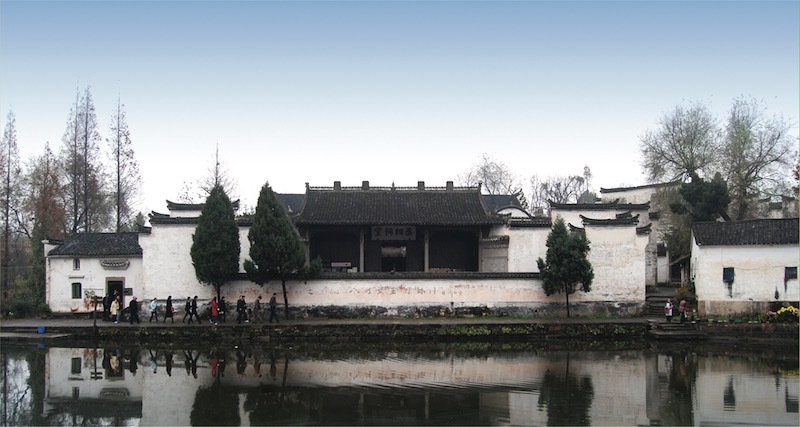 The Zhuge family moved here in the fourteenth century and gradually overtook the previous village and renamed it. 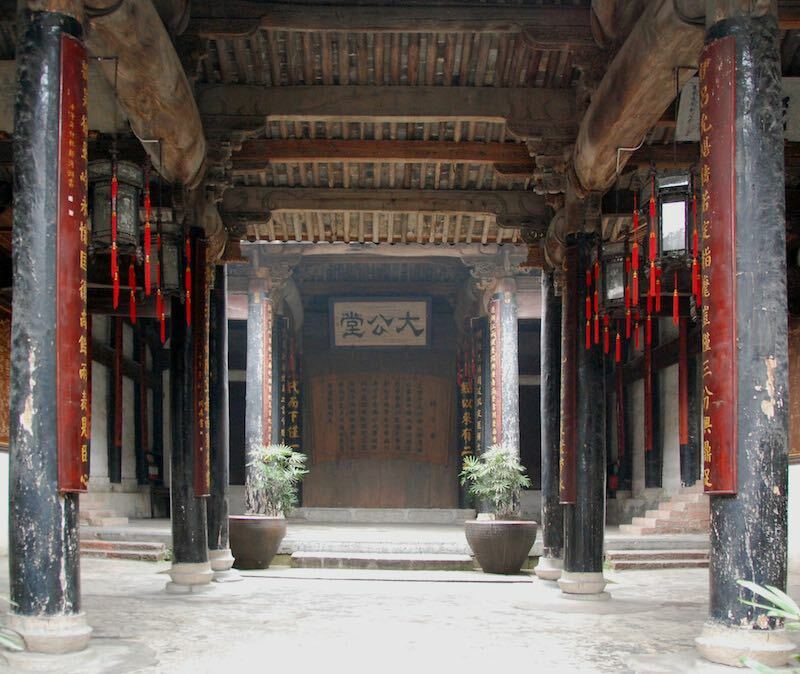 The scenic site of Zhuge Bagua Village consists of the Ancestral Hall of Prime Minister, Dagong Hall, Bell Pond, Tianyi Hall, Dajing Hall, Yongmu Hall, Shangtang Ancient Commercial Street, as well as more than 200 architectural sites from the Ming (1368-1644) and Qing (1644-1911) dynasties. The ancient buildings have very distinct architectural features: cyan bricks combined with gray tiles, horse’s head walls (high walls which should prevent fires from spreading through the village), thick roof beams and pillars, and small bedrooms. These architectural and cultural relics are well preserved despite natural disasters and repeated wars that destroyed many ancient buildings during China's dynastic changes. 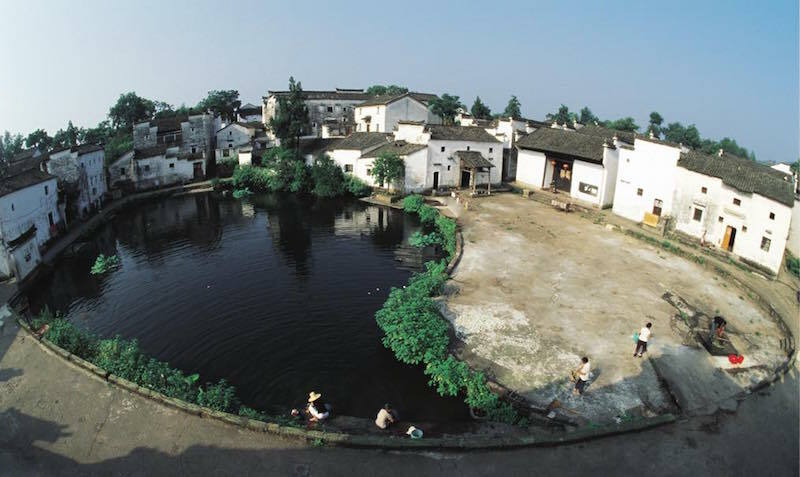 In 1996, this mysterious hidden village was designated as a national key historical and cultural site by the State Council. The village was designed and constructed by Zhuge Dashi, 27th descendant of Zhuge Liang, following the design of the Eight Diagrams. This layout was used because Zhuge Liang applied the theory of the Eight Diagrams to military formation, which was very effective in defeating rivals. The village center is the Bell Pond, divided into yin and yang. Eight lanes radiate outward from it, forming the inner Bagua and carving the village into eight blocks. The village is surrounded by eight hills, representing the outer Bagua. To newcomers, the village is like a labyrinth, with many dead-end lanes impossible to navigate without a guide. Local residents are proud that the confusing layout of the village has helped defeat enemies. Zhuge residents show their respect for Zhuge Liang by observing two festivals: his birthday on the 14th day of the fourth lunar month, and the anniversary of his death on the 28th day of the eighth lunar month. On these two days, a temple fair is held and theatrical troupes perform as part of the grand ceremonies. From Jinhua Train Station: take Bus line 11 or 19 to Jinhua South Bus Station (金华汽车南站) and then take a bus to Lanxi West Bus Station (兰溪汽车西站). From there you can take a dedicated bus to Zhuge Village (诸葛八卦村) (shift interval is about 5 minutes). Jinhua Train station is has excellent G-train connections to Hangzhou and Shanghai. from Jinhua: follow the G330 along Danxi Avenue (2.8Km) and then for 12.8km more, turn left at Putanggang and turn right in Xinqiaotou. from Hangzhou: follwo the Hangxinjing Expressway, leave at Shouchang Exit. from Shanghai: Shanghai-Xiamen-Expressway, switch to Shanghai-Hangzhou-Expressway, then to the Hangzhou-Jinhua Expressway, leave at Youpu Exit. from Yiwu: Sihai Avenue — Jinhua-Yiwu highway — North Second Ring Road, follow the G330 along Danxi Avenue (2.8Km) and then for 12.8km more, turn left at Putanggang and turn right in Xinqiaotou. Mary Fuller wrote a blog post about Zhuge Bagua village during the first session of the Jinhua Homestay project in Suoyuan. 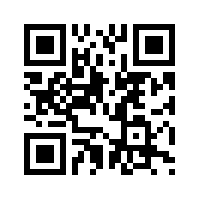 Wikipedia has a short article about Zhuge village.